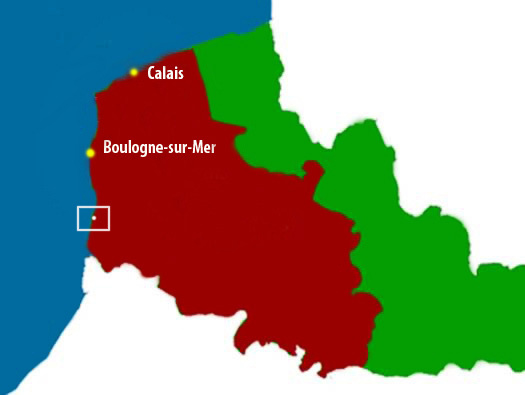 StP Berck Nord, Berck Bellevue H.K.B., K.V.A D2. 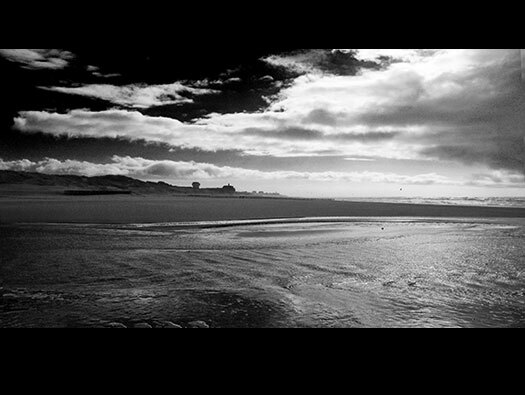 StP Berck Nord, Berck Bellevue H.K.B. 3 x Geschützstellung (open ringstands). 1 x 4.7cm Pak K.36(t0. 2 x 2cm Flack 30. 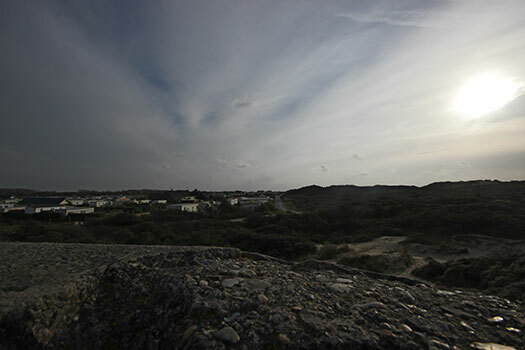 Plan StP Berck Nord Heers Kusten Batterie. 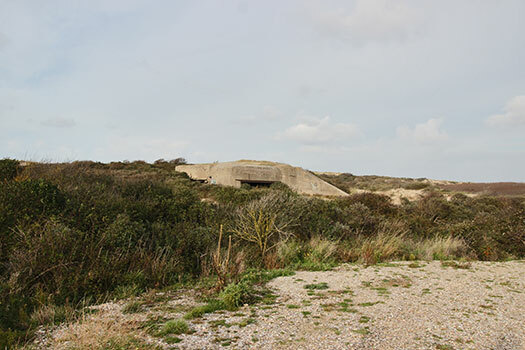 Heers Kusten Batterie (Army Battery). 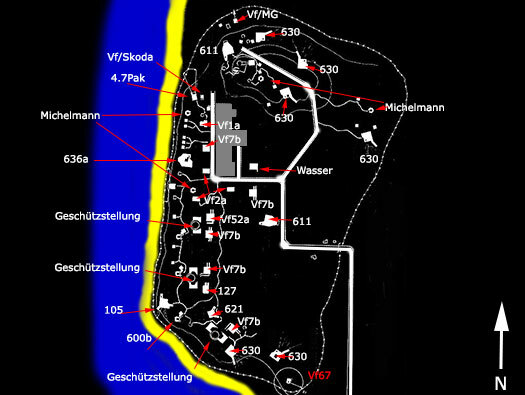 Plan of the battery, this is a mix of a three gun battery and a defensive site, defending the north beach at Berck. For this we have a complete cross section of bunkers from quite early machine gun bunkers, open Geschützstellung to R611, but no newer types? This is the start of our walk, we visited a lot of bunkers, about half of what was there. Many have been removed and also the massive hotel/hospital has now been removed. 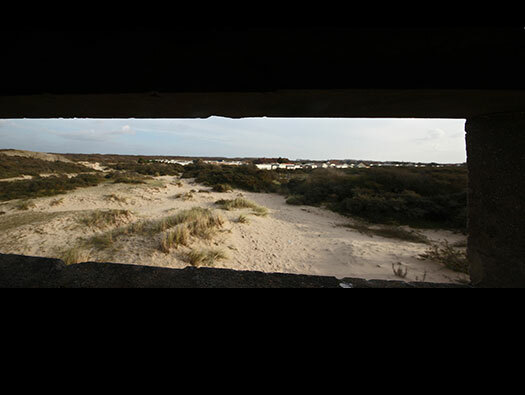 Bunkers littering the beach and sand dunes. L to R R621 group shelter and an R127 a group bunker with a forward apron. R621 crew room, gas lock and Tobruk. R127, crew room, store room, ammunition & gas lock. R600b or a 5cm KwK gun with a small storage bunker. A respectable little gun taken from a tank when they were made redundant as the 7.5 & 8.8cm came on stream. The gun was fitted to a modified chassis and bolted to a concrete base. 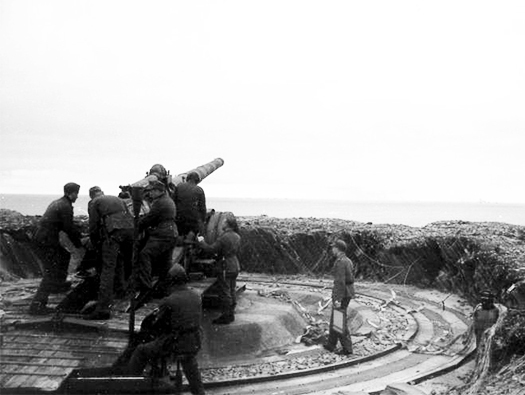 5cm KwK L42 Pak gun. This is how it may have looked. Storage bunker for the 5cm KwK gun. A rather large casemate just for a machine gun with quite few rooms. This type was not rally cost effective and was dropped later on. The metal plate covering the embrasure. Rear entrance with a close combat window on the left to cover the door. Crew room and close combat window covering the entrance passage. Machine gunners linking up belts. The periscope room would be connected to the gun room and could guide the gun onto its target. Close combat embrasure it looks like a 57P8? This is the exit passage with two recesses each side to allow radio aerials to slot in. They were telescopic and were raised up by cables and a winding handle. Exit and I feel I have been found? Attached Tobruk for area defence. A cutaway of a bunker Tobruk. Geschützstellung (open ringstands) Turm 2. This is the second of three Geschützstellung that were here. The third I believe has been completely destroyed. They were built for 17cm K 18 guns. A 17cm K18 gun on a Geschützstellung. The bombing of StP Berk Nord. Most Allied heavy and light bombers pounded the batteries all the way up the coast. The gun sitting in the middle and two ammunition spaces each side. The racer ring would be bolted down to these bolts. The racer is the outer ring that the guns trail rest on. The view from the sea. Looking down the entrance to the ammunition room. Geschützstellung (open ringstands) Turm 1. 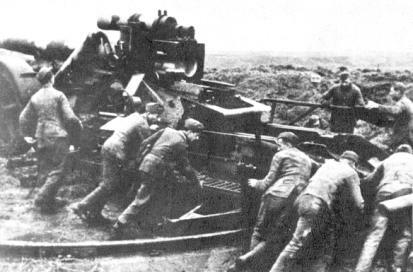 This is the second Geschützstellung for 17cm K18 gun. The large centre plinth for the gun to sit on.. The guns racer where the trail would slot in and slide around. You can see the guns racer in the picture. 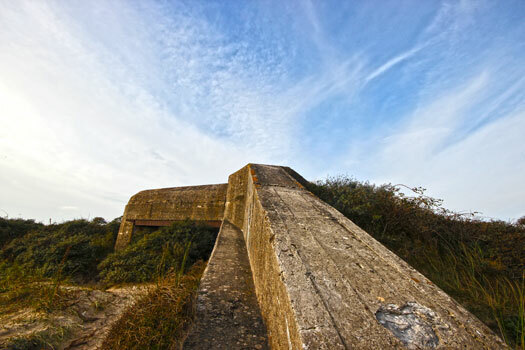 The escape hatch and steel ladder rungs up the side of the bunker. 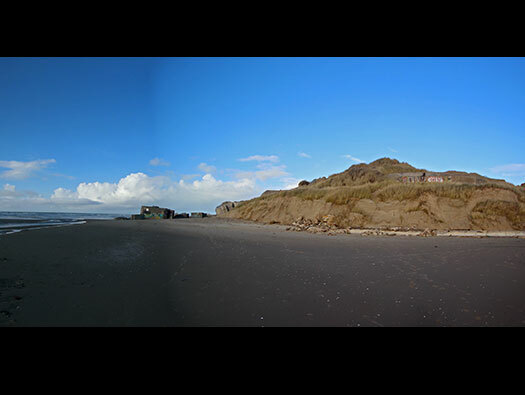 This bunker was sunken to its roof in the sand but all that has been washed away by the sea. A plan of this Vf2a showing the escape and a brick wall holding back the sand. Looking into the crew room. Crew room, there would have been bunks attached to the wall and roof around the room. The bunkers door is at the fa end and the left wall has been blown out. Looking out of the escape hatch. A rather damaged model. The escape showing up and sand filling the entrance passage. A form of ringstand for a machine gun. A very distinctive shape and I think ammunition storage below. If you are good with Jig Saws you would be able to build your own bunker. Brick work from a bunkers escape. Periscope tube, air vent, chimney, ??. R611 casemate for a 7.5cm F.K38. This one covers the right flank. Plan of an R611 with a large crew room, two ammunition rooms, gun room and central passage. Powder box for a 7.5cm gun. R669 showing the extraction system of foul air after the gun has fired. A very strong bunker and looks as though it has been completely missed by aerial bombing. There he is again always in the way. This is where the 7.5cm F.K38 gun would have sat. The door into the two ammunition rooms, one for the case and the other for the shells. The other side is the crew room under the sand. The site of the Sanatorium Bellevue. 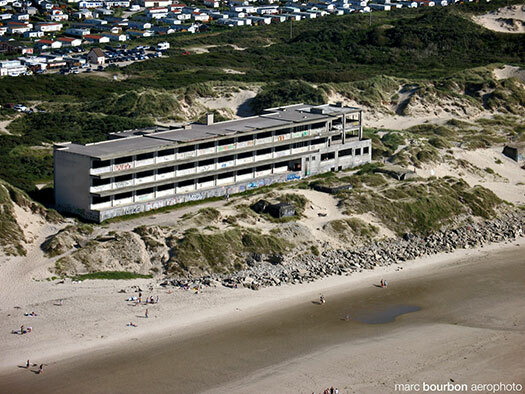 Was derelict for many years, it was demolished quite recently. Map of this part of Berck with the Sanatorium in the yellow square a the top. Bombs being released over StP Berck Nord but may be landing on Berck aerodrome inland. RAF 250 pound General Purpose bombs. R636a Command Post for Army Batteries. An R636a was here but I think demolished before or at the same time as the Humanitarian. It would have controlled the 17cm K18 batteries in the area. Site plan where it was sited. 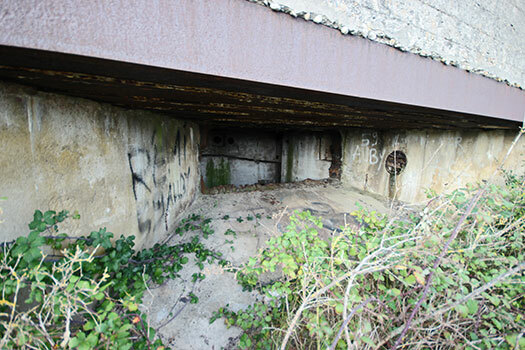 R630 casemate with two guard posts. R630 casemate for a heavy machine gun. I presume this is authentic to the battery and there is another about 100meters beyond stood on the ground. The view through the observation slit. There is another post like this about 100meters in the thick undergrowth and at ground level. In the distance is an R630 covering any attack north from behind the beach. One heavy machine gun behind a thick steel plate. Machine gun casemate gun fitting. We parked back outside the camping site. Oh dear what joys, many cars with ONE man in each. If you do enter this bunker, be very careful. Its used by many of these men and quite honestly there are better R630's to visit in the area. Best give this one a miss. R630 the view from the Tobruk. This is the view that the machine gun would have had right down the road and covering the flatter ground on the left side. 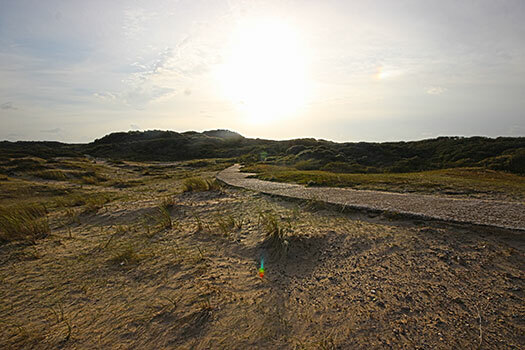 To the right its all sand dunes and hard to access for an attack. 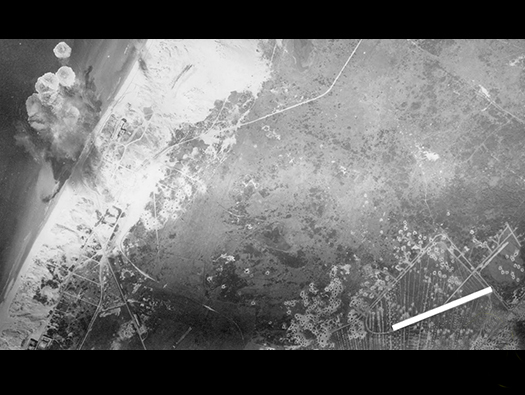 There would have been a heavy steel plate closing off the aperture with a viewing slit and a machine gun fitting. A gunner set behind an Mg34 fitted into a 78P9 plate. Part of the concrete road. This road would have supplied the StP with all its needs. Supplies would have been delivered by wagon. The flanking wall and the bricked up escape . R621 group shelter Tobruk defence. This is part of one of the ammunition of Turm 1. How the battery of 17cm K18 guns would have looked.